William Cardinal Laker was born in Brockham, Surrey in late 1887. In 1891 he was living in Falkland Road and in 1901 he was at 4 Bentsbrook Cottages. He married Annie Smith on 2nd August 1913 in St John’s Church, North Holmwood. He was a member of the Holmwood Lodge of the Oddfellows, a friendly society that provided mutual help and ran social events. He was conscripted and attested on 2nd December 1916 (Number 45626 later 31778). He was posted to the army reserve the next day. He was living at 11 Harrow Road East, but then moved to Rymer Road, Croydon. He did not see actual service until he was mobilised in March 1917, when he joined 3rd (Reserve) Battalion East Surrey Regiment, a depot/training unit, in Dover. He was posted to the 1st Battalion in France in June, following ten weeks of training. On 19th July 1917 he was transferred to 2nd Battalion, Manchester Regiment, remaining in France. 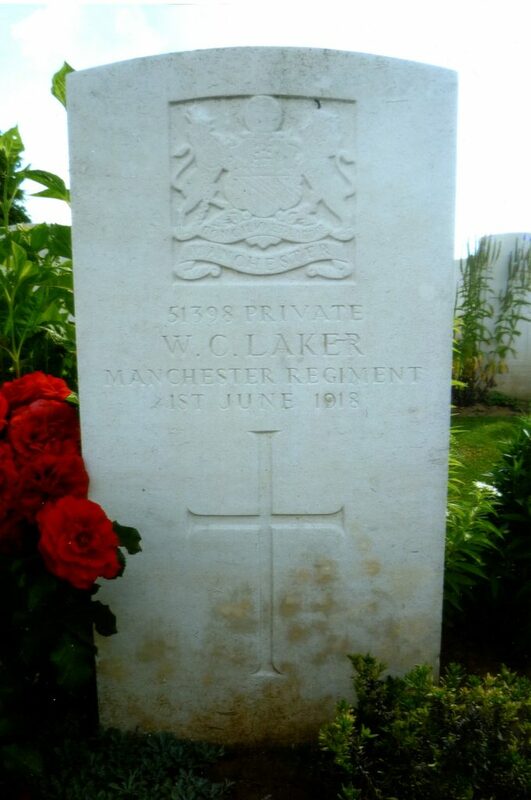 He died of wounds on 1st June 1918 and was buried at Cabaret-Rouge British Cemetery, Souchez, Pas de Calais. His widow, Annie, was living in Croydon with their son, Jason, who was born on 17th September. Commemorated on the Dorking Oddfellows’ Hall memorial and on St Martin’s and St Paul’s Church memorials Dorking. Previously : A/Lieutenant-Col Humfrey Hayes Kennedy Next : L/Cpl Thomas Lucas M.M.